Crashed : how a decade of financial crises changed the world / Adam Tooze. The age of lone wolf terrorism / Mark S. Hamm and Ramon Spaaij. Convicted and condemned : the politics and policies of prisoner reentry / Keesha M. Middlemass. Crime and social justice in Indian country / edited by Marianne O. Nielsen and Karen Jarratt-Snider. Gender, psychology, and justice : the mental health of women and girls in the legal system / edited by Corinne C. Datchi and Julie R. Ancis. Can I teach that? : negotiating taboo language and controversial topics in the language arts classroom / edited by Suzanne Linder and Elizabeth Majerus. Engaging primary children in mathematics / Margaret Sangster. Reaching reluctant young readers / Rob Reid. 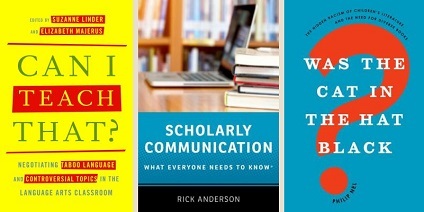 Scholarly communication : what everyone needs to know® / Rick Anderson. Trans* in college : transgender students’ strategies for navigating campus life and the institutional politics of inclusion / Z. Nicolazzo ; foreword by Kristen A. Renn ; afterword by Stephen John Quaye. Was the Cat in the Hat black? : the hidden racism of children’s literature, and the need for diverse books / Philip Nel. Blackface nation : race, reform, and identity in American popular music, 1812-1925 / Brian Roberts. The hope of another spring : Takuichi Fujii, artist and wartime witness / Barbara Johns ; foreword by Roger Daniels ; introduction to the diary by Sandy Kita. Magnum manifesto / edited by Clément Chéroux ; in collaboration with Clara Bouveresse. Revival type : digital typefaces inspired by the past / Paul Shaw, foreword by Jonathan Hoefler. The Caribbean before Columbus / William F. Keegan and Corinne L. Hofman. Defending the Motherland : the Soviet women who fought Hitler’s aces / Lyuba Vinogradova; with an introduction by Antony Beevor; translated from the Russian by Arch Tait. Genocide : a world history / Norman M. Naimark. The great stain : witnessing American slavery / Noel Rae. The Holocaust : a new history / Laurence Rees. It’s all a game : the history of board games from Monopoly to settlers of Catan / Tristan Donovan. Lighting the fires of freedom : African American women in the civil rights movement / Janet Dewart Bell. The prison letters of Nelson Mandela / edited by Sahm Venter ; foreword by Zamaswazi Dlamini-Mandela. The promise and the dream : the untold story of Martin Luther King, Jr. and Robert F. Kennedy / David Margolick ; foreword by Douglas Brinkley. Viet Nam : a history from earliest times to the present / Ben Kiernan. The voice of the past : oral history / Paul Thompson with Joanna Bornat. Voices of civil rights lawyers : reflections from the deep South, 1964-1980 / edited by Kent Spriggs ; foreword by Marian Wright Edelman. From a Lisbon rooftop / Eric Steineger. Maternal metaphors of power in African American women’s literature : from Phillis Wheatley to Toni Morrison / Geneva Cobb Moore ; foreword by Andrew Billingsley. Reading William Gilmore Simms : essays of introduction to the author’s canon / edited by Todd Hagstette. Sabers and utopias : visions of Latin America / Mario Vargas Llosa ; translated from the Spanish by Anna Kushner. Prevention is better than cure : learning from adverse events in healthcare / Ian Leistikow. Billy Graham : American pilgrim / edited by Andrew Finstuen, Anne Blue Wills, Grant Wacker. The evil of banality : on the life and death importance of thinking / Elizabeth K. Minnich. Seven ways of looking at pointless suffering : what philosophy can tell us about the hardest mystery of all / Scott Samuelson. After hope and change : the 2012 elections and American politics, post 2014 election update / James W. Ceaser, Andrew E. Busch, and John J. Pitney Jr. The American nonvoter / Lyn Ragsdale and Jerrold G. Rusk. The coddling of the American mind : how good intentions and bad ideas are setting up a generation for failure / Greg Lukianoff and Jonathan Haidt. The death of truth : notes on falsehood in the age of Trump / Michiko Kakutani. Defying the odds : the 2016 elections and American politics / James W. Ceaser, Andrew E. Busch, and John J. Pitney Jr.
Generation wealth / Lauren Greenfield ; foreword by Juliet Schor ; photographs edited with Trudy Wilner Stack ; text edited with Susan Lynley Welsh. Just immigration : American policy in Christian perspective / Mark R. Amstutz. The Obama doctrine : American grand strategy today / Colin Dueck. Plundered skulls and stolen spirits : inside the fight to reclaim native America’s culture / Chip Colwell. The psychology of racial colorblindness : a critical review / Philip J. Mazzocco. To end a presidency : the power of impeachment / Laurence Tribe and Joshua Matz. Domestic abuse, child custody, and visitation : winning in family court / Toby G. Kleinman and Daniel Pollack. 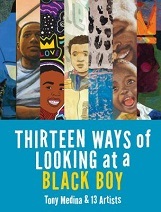 Thirteen ways of looking at a black boy / Tony Medina & 13 artists. A gambler’s anatomy : a novel / Jonathan Lethem. American histories : stories / John Edgar Wideman. The Best American short stories 2018 / selected from U.S. and Canadian magazines by Roxane Gay with Heidi Pitlor ; with an introduction by Roxane Gay. The children’s crusade / Ann Packer. Commonwealth : a novel / Ann Patchett. How are you going to save yourself / JM Holmes. Lucky us : a novel / Amy Bloom. The overstory : a novel / Richard Powers. Red, white, blue / Lea Carpenter. The Yonahlossee Riding Camp for girls / Anton DiSclafani.